Feskarn is the solo project of Niklas Larsson from Uppsala, Sweden. Niklas began this Viking black metal band in 2010 and it was his first metal effort. Before Feskarn, he was experimenting with electronic music. 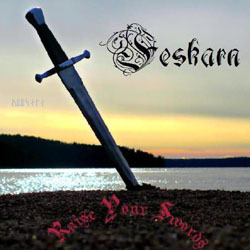 “Raise Your Swords” is the first official work of the band and it’s a full-length album, released by the German label Pesttanz Klangschmiede in the end of 2012. “Raise Your Swords” is a short album, since its 8 songs are less than 31 minutes long. Their guitars have a very sharp and “acidic” sound, while the overall production is also totally unpolished with a definitely underground approach. Despite the extreme nature of their music, the total result is quite melodic, due to the extended use of synths. So, while guitars and vocals are closer to raw black metal, keyboards play very epic tunes with beautiful melodic lines. Except for the typical epic synths sound, he also uses many piano parts and some folk instruments, but all of them sound clearly like keyboard samples. Niklas’ music past has its impact on Feskarn’s sound too, since his keyboards have a somehow electronic touch. Luckily enough these electronic elements fit perfectly with both their black metal guitars and their folk Viking synths or their wonderful piano melodies. The best evidence for the success of this experiment is the 4th song “The Warrior’s Return“, the highlight of the album for me. Unluckily there are some weaker parts too, mostly in the 2 closing songs… All of the lyrics are in English dealing with epic themes, in a rather simple way I think. Despite the average production and raw sound, I find Feskarn a quite interesting band. It’s not only because of some very catchy melodies, but most importantly because of its personal sound. I believe that if Niklas focuses more on this genre (in his soundcloud page you can listen to music he wrote for almost every genre!!) and works more on his sound, then he could make something really good. Anyway, “Raise Your Swords” is an enjoyable album that fans of underground Viking folk black metal can check. It is released via Pesttanz Klangschmiede in a limited to 500 copies standard jewel-case edition with 12-page booklet. In his Facebook profile you can get a taste of the band’s music.